GERMANY, ITALY DECLARE WAR ON U.S.
At this point in time, though, the Luft­waffe’s air battle against Britain was lost, the blitz­krieg on Germany’s Eastern Front (Operation Barbarossa) had failed with a loss of over 750,000 men to the parti­ci­pating Axis powers, and the Ital­ian ven­ture in North Africa by Hitler’s Axis partner Benito Mus­so­lini needed all the sup­port Gen. Erwin Rommel’s German Afrika Korps could pro­vide. Now before in­sanely cheering depu­ties of the sham Reichs­tag Hitler screamed in­sults, often bizarre ones, at his new enemy, Presi­dent Franklin D. Roose­velt, “that man who, while our sol­diers are fighting in snow and ice . . . likes to make his chats from the fire­side, the man who is the main cul­prit in this war.” No doubt British Prime Minis­ter Winston Chur­chill was as sur­prised as Roose­velt was that the Fuehrer’s favorite bête noire had shifted from the stub­born British bulldog to the determined American eagle. Above: Headlines in the late edition of the New York Times, Decem­ber 11, 1941. 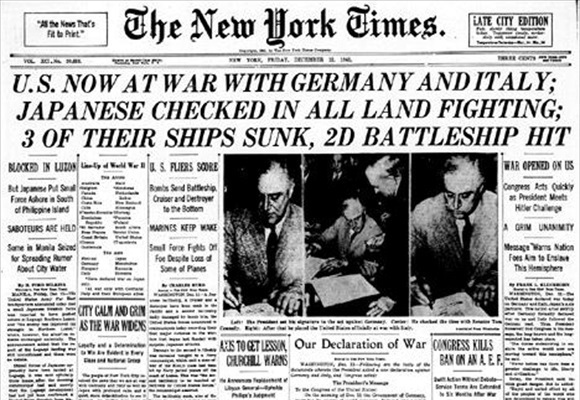 Earlier in the day the U.S. Senate and House of Repre­senta­tives passed a unan­i­mous declara­tion of war on Ger­many and Italy, only hours after Hitler had declared war on the U.S. and three days after Congress had declared war on Japan. 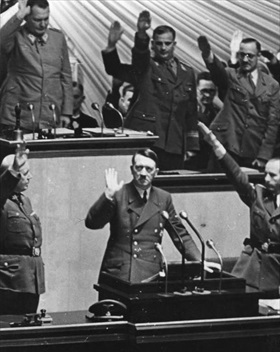 Left: Hitler receiving the endorsement of the Reichstag on Decem­ber 11, 1941, after declaring war on the United States. Full of opti­mism and confi­dent of vic­tory, Hitler told Reichs­tag deputies that Ger­many, Italy, and Japan had con­cluded an agree­ment to “wage the com­mon war forced upon them by the U.S.A. and Eng­land with all the means of power at their dis­posal, to a vic­torious con­clu­sion [and pledged] . . . not to con­clude an armis­tice or peace with the U.S.A. or with Eng­land without com­plete mutual unders­tanding.” Less than four years later both Ger­many and Japan were com­pelled to sign sepa­rate uncon­di­tional sur­renders by their enemies on May 7–8 (Germany) and September 2 (Japan), 1945. 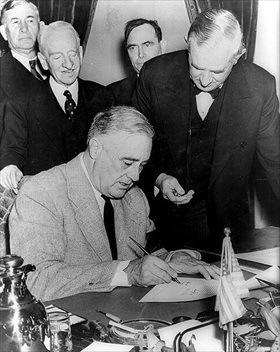 Right: President Roosevelt signing the declara­tion of war against Ger­many. Texas Senator Tom Con­nally stands to the left of the presi­dent, holding a pocket watch to fix the exact time of the signing—3:05 p.m. EST. One minute later Roose­velt signed the declara­tion of war against Italy. In so doing the U.S. joined a war that threat­ened the sur­vi­val of peoples and nations in Europe, North Africa, and the Far East. Six months later, on June 5, 1942, Con­gress declared war on Ger­many’s and Italy’s Axis partners, Roma­nia, Hun­gary, and Bul­garia. Not until Febru­ary 10, 1947, were peace treaties con­cluded between the vic­torious Allies and Italy, Fin­land, and the Soviet Union’s East Euro­pean satellite countries of Romania, Hungary, and Bulgaria.